A boat transporting migrants arrives in the port of Messina after a rescue operation at sea on April 18, 2015, in Sicily. About 700 people are feared dead after a fishing boat carrying migrants off the coast of Libya capsized on Saturday. That could be an optimistic estimate: Some reports suggest as many as 950 people may have been crammed into the 60-foot vessel. If these numbers are even close to accurate, it’s not only the worst tragedy in Europe’s current migrant crisis—it may be the worst maritime disaster in the Mediterranean since World War II. About 900 migrants making their way from North Africa, mostly Libya, to Europe were already believed to have been killed since the beginning of this year, and the number of migrants attempting to make the crossing is likely to increase in the summer months. EU foreign and interior ministers are holding emergency talks on the issue amid questions about whether anything could have been done to prevent this year’s deadly toll, and what can be done to address the crisis going forward. The first question is the easier one to answer: Yes. Tragedies like this one are exactly what many rights groups warned would happen when Italy ended its yearlong search and rescue operation in the Mediterranean last October. Under Operation Mare Nostrum, the Italian navy patrolled a 27,000-square-mile swath of the Mediterranean, rescuing more than 100,000 migrants. 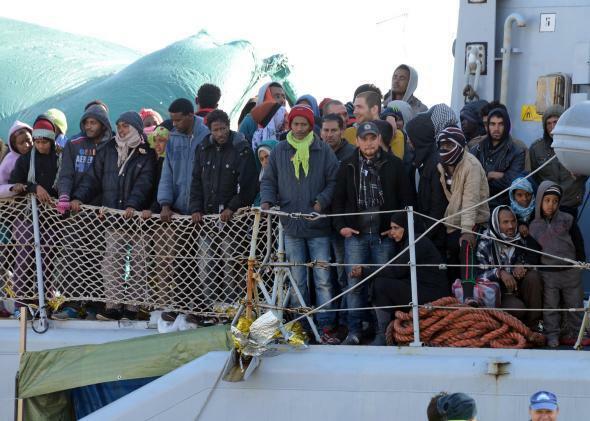 But in October, with migrant numbers waning due to winter weather, Mare Nostrum was replaced with an EU-led effort, Triton, which had a third of the budget, less than a tenth of the personnel, and patrolled only 30 miles off the Italian coast. Italian ships do still rescue migrants—the coast guard picked up more than 10,000 last week alone—but there’s no longer a concerted effort to seek them out beyond Italy’s coastline where the danger is greatest. The Italian government said it couldn’t indefinitely sustain the costly Mare Nostrum operation, and some EU countries were reluctant to support a more ambitious plan, arguing, as one British foreign office official put it, that a bigger search and rescue operation would act as an “unintended pull factor,” encouraging more migrants to make the trip. But that pull factor, to the extent that it exists, is insignificant compared with the push factor of violence, instability, political repression, and economic distress in North Africa and the Middle East. So even without the “pull” of Mare Norstrum’s safety net, migrants are coming to Europe at about the same rate as last year, while the number of deaths has increased tenfold over this time in 2014. As for what can be done going forward: Italian Prime Minister Matteo Renzi was right when he said during a meeting in Washington with President Obama last week that the crisis isn’t going anywhere; migrants will try to make their way to Europe until some measure of stability is returned to Libya. The North African country is the origin of the majority of migrants who attempt the Mediterranean route into Europe, and political chaos there has allowed people smugglers to operate with impunity. But Libya isn’t getting any more stable this summer, and neither are political conditions in Somalia, Eritrea, and Syria. So the short-term solution is fairly obvious: The EU as a whole needs a more ambitious plan to rescue migrants. Southern European countries like Greece, Malta, and Italy complain, justifiably, that they’re shouldering an unfair portion of the burden for dealing with migrants, many of whom intend to head north once they reach Europe. But getting other European countries on board has been a tough sell—as recent elections have suggested, anti-immigrant sentiment is high on the continent. Last weekend’s tragedy may finally underline the need for some kind of action. Europe can’t afford to wait for conflicts in North Africa and the Middle East to resolve themselves before taking steps to prevent the Mediterranean from turning into a watery graveyard.